Christmas and New Year have been and gone and after a tumultuous lead up (since Christmas can be very overwhelming for kids on the spectrum as I wrote about here), I thought I'd give a quick update on the last couple of weeks in the Nym household. Tyger's ASD means everything is either the best or the worst. There's no nuance, no grey, no in between. My sister has always been much the same. Any big events like Christmas, birthdays, performances, parties etc. are either euphoric successes or devastating failures. According to Tyger this was, 'the best Christmas ever.' It was only his fourth Christmas and I doubt he can remember any previous ones (perhaps for the best in the case of his first Christmas when he had an ear infection and slept through most of the day) so I can see how he reached his assessment. However, this doesn't mean that every moment in the day was amazing...or even good. Last year Tyger was completely absorbed by each present he got to the point where it was hard to get him interested in the next so other people opening presents wasn't a problem. This year was...different. He moaned constantly whenever someone else was opening a present and complained that he wanted a present. In a household of eight people who go in for Christmas in quite a big way, this meant a lot of presents and so a lot of time spent moaning. The whinging and whining culminated in Tyger opening a present from my sister (Colour Blind Sister, not Aspie Sister). Now, Colour Blind Sister wanted to get Tyger a toy till, which was an excellent present idea. Unfortunately, it was such an excellent present idea that the Wolf's parents wee already getting him one so CB Sister had to rethink. Tyger opened the present from her. It was a very cute, miniature wire shopping basket to go with said till. He was unimpressed. 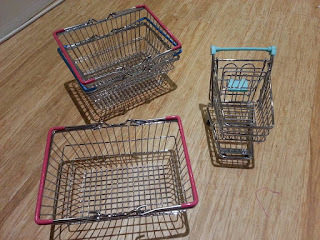 In fact he got extremely upset and angry and proclaimed he wanted a tiny shopping trolley like Aspie Sister and not a shopping basket. 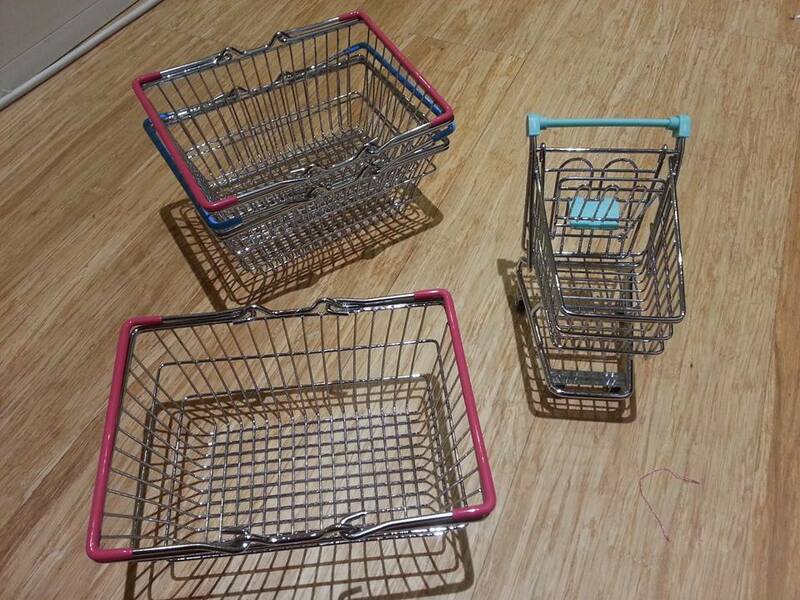 The baskets and - clearly superior - tiny trolley. Luckily, it turned out my mum had, in fact, bought Aspie Sister an identical basket (to go with the trolley) and quickly rummaged around the tree to give it to my sister so she and Tyger could be 'matching'. Bear also has one from CB Sister and they seem to have been accepted, now. All in all, Christmas was a success. Tyger immediately looked to see if the mince pie, sherry and carrot left for Father Christmas and the reindeer were gone before even glancing at his stocking, which was very sweet. Everyone in the house seemed happy with their presents. I suspect Tyger's tablet will see a lot of use and he loves his bike. The cubs have enough Duplo to rival the laundry basket mountain in quantity, which is pretty impressive. 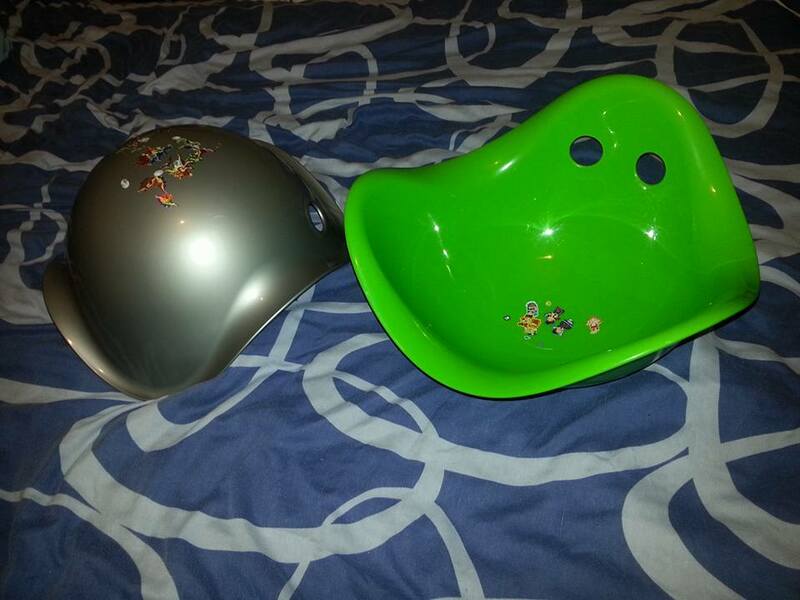 Wolf and I also got the cubs a 'Bilibo' each. Whilst they're great for all young kids, they came highly recommended in particular for kids with ASD on a forum I frequent. I daren't try to describe them because I've already had the piss royally taken out of me for my - apparently terrible - explanation when I first bought them. Instead, I'll include a photo. Bilibos (I promise I'm not on commission and I'm not popular enough yet to be asked to review products!) can be sat in and used for spinning and rocking. Tyger also likes to climb on his when it's upside down and jump off it. Apparently, they can also be used for games with balls and water. The reason they're recommended for autistic children is they're great sensory toys that can provide a physical outlet when the kids are becoming overloaded (and these ones have also been decorated by stickers, which provided a little peace for me for a few minutes so they've already been very useful). I did manage to avoid a meltdown a few days ago when Tyger was becoming fraught and I convinced him to let me spin him in his Bilibo. Beforehand he'd been following Bear around trying to wind him up. Afterwards he took Bear stacking blocks Bear had dropped. It may seem small but I was very relieved! Despite giving little to no inkling of what I wanted for Christmas (not because I thought it would be funny to leave everyone guessing but because I genuinely didn't know what I wanted) I was given some lovely presents. I'm at home with the cubs pretty much all day everyday, my one real hobby (this blog) doesn't require anything I don't already have (a laptop) and we're living with my parents at the moment so I can't really do much with ornaments or household items. As such, I'm kind of difficult to buy for right now but even so I got a lot of awesome clothes, a few Terry Pratchett and William Blake themed presents (Tyger's pseudonym on here is largely inspired by Blake's poem The Tyger and he's my favourite poet), three mugs (when you drink as much tea as I do these are extremely practical gifts likely to see far more use than most presents ever will) and - in the same vein - a big box of various teas of the world. I have made a dent in the latter. I don't know if Tyger will remember anything about this Christmas (I guess it's becoming increasingly likely any moment will be his first memory) and Baby Bear almost certainly won't but nonetheless I think this was an overall good Christmas. I guess our 'ASD Christmas' turned out okay. Those Bilibo things look great. We used to have. Trampoline for the big man and I'd send him out for a jump when he was getting overloaded too. I'll have to look these up. Glad your Christmas was a success! Yes, there's a trampoline here but Tyger has always been quite physically cautious and he's unsettled by feeling like he's not in control. Bear loves it, though! Thanks. It was touch and go but all was well in the end! Unfortunately they don't seem to do adult ones, which is a shame because I know my teenage autistic sister would love one! As would her boyfriend, actually. Really glad you had a good Christmas. I know just how tough it can be, so happy it was a good one for you! Im glad you had a good christmas. My nephew was always hard to buy for at christmas. If a present wasnt on his list he didnt want it, and as he only put 1 or two items on his list, he refused a lot of hia presents. My sister in law worked hard to teach him how to accept gifts in a socially acceptable way. It is easier now because he has added chocolate to his list, so he always gets a box of the poshest ones I can find which he loves.